The book begins with a cursory look at wavelet transformation development and illustrates its allure in digital signal and image applications. Next, a chapter on digital image basics, quantitative and qualitative measures, and Huffman coding equips readers with the tools necessary to develop a comprehensive understanding of the applications. Subsequent chapters discuss the Fourier series, convolution, and filtering, as well as the Haar wavelet transform to introduce image compression and image edge detection. The development of Daubechies filtersis presented in addition to coverage of wavelet shrinkage in the area of image and signal denoising. The book concludes with the construction of biorthogonal filters and also describes their incorporation in the JPEG2000 image compression standard. The author's "applications first" approach promotes a hands-on treatment of wavelet transforma-tion construction, and over 400 exercises are presented in a multi-part format that guide readers through the solution to each problem. Over sixty computer labs and software development projects provide opportunities for readers to write modules and experiment with the ideas discussed throughout the text. The author's software package, DiscreteWavelets, is used to perform various imaging and audio tasks, compute wavelet transformations and inverses, and visualize the output of the computations. Supplementary material is also available via the book's related Web site, which includes an audio and video repository, final project modules, and softwarefor reproducing examples from the book. All software, including the DiscreteWavelets package, is available for use with Mathematica®, MATLAB®, and Maple. Discrete Wavelet Transformations strongly reinforces the use of mathematics in digital data applications, sharpens programming skills, and provides a foundation for further study of more advanced topics, such as real analysis. 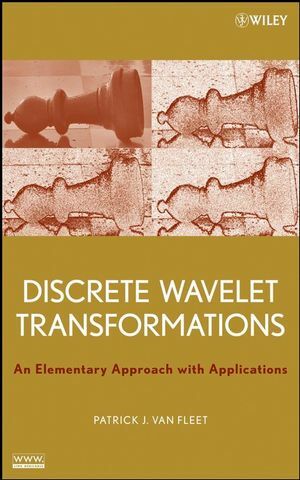 This book is ideal for courses on discrete wavelet transforms and their applications at the undergraduate level and also serves as an excellent reference for mathematicians, engineers, and scientists who wish to learn about discrete wavelet transforms at an elementary level. Patrick J. Van Fleet, PhD, is Professor of Mathematics and Director of the Center for Applied Mathematics in the Mathematics Department at the University of St. Thomas in St. Paul, Minnesota. He is the author of several journal articles in his areas of research interest, which include wavelets, multiwavelets, and problems in spline theory. Dr. Van Fleet has been an invited lecturer at many seminars, colloquia, and professional meetings, and he has conducted several workshops for faculty interested in teaching a course on wavelets and their applications. Features a chapter on digital images, quantitative/qualitative measures, and encoding; two chapters dedicated to applications; an introduction to the Fourier Series; and detailed development of pseudocode for all wavelet transforms and their inverses. Ample use of examples and graphics help to provide thorough explanations of concepts. Over 340 exercises are included as well as hints to the solutions. The author has prepared a software package called DiscreteWavelets in order to perform the operations or work through the applications described in the text. A Related Website provides computer labs, lecture slides, interactive examples, final project modules, and a discussion board. Mathematica and Matlab datasets are also available online.